Good journalism is more difficult for me to find these days. I fondly recall the CNN Headline News of the 1980's (not the one today): 30 minutes; mainly facts; no intentional slant; a single newscaster; no banter; no yelling; no fluff. Granted, it was not in-depth reporting, but the newscast gave you enough accurate information to understand the situation and make an informed opinion. It is possible my recollections of the 'good old days' are faulty; perhaps journalism has always been slanted or sensational, and I simply have become more observant or wiser. I have a few ideas on journalism for someone or some group to run with. These ideas suggest a new kind of journalism for people like me. I call it bona fide journalism. I do not have all the answers. I know the subject is more complex than I make it out to be. My hope is you can start with these ideas, improve them, enhance them, and make them a reality. Please note my ideas are not intended to replace or supersede other journalistic styles or genres that may have some of the same objectives, such as investigative or collaborative journalism. Bona fide journalism is an additional form. I will introduce this new kind of journalism through a framework depicting a spectrum of journalistic genres. Aside note: I have drawn the spectrum vertically to remove any reference to a “far right” or “far left” of the spectrum as those terms have negative political connotations which are not relevant to this discussion. The middle row of the spectrum refers to the genre of objective journalism. Objective means not being influenced by personal feelings or opinions in considering and representing the facts. The journalist writes or presents a news report independent of his or her beliefs. All sides of the story are presented as to be neutral or impartial. As equal weight is given to all sides, credence may be given to a position even if the facts do not exist to support it. Filtering and analysis are avoided, otherwise questions of bias may surface. Advocacy journalism or agenda-based journalism shown in the bottom row of the spectrum is driven by the position being advocated. The opinion is pre-conceived and intentionally drives what facts to present, what facts not to present, and, for the unscrupulous practitioners, what misleading or false statements to include. Advocacy-based journalism is transparent about their going-in position; the Sierra Club and National Rifle Association, as examples, are up-front about their views and what they advocate. Agenda-based journalism is not transparent and may present itself with an ambiguous or misleading name or tagline. I have coined the term bona fide journalism both for what it stands for and to avoid confusion with other terms used to describe existing journalistic genres and styles. Bona fide comes from the Latin meaning 'with good faith.' As an adjective, it means genuine or real. As an adverb, it means sincerely, without intention to deceive. Bona fide journalism is genuine, real, sincere, and done in good faith. Unlike agenda-based journalism, there is no preconception of a position since the facts must be gathered first. Unlike objective journalism, there is additional value-add to the journalistic process: facts are vetted beyond verification to include truthfulness (“yes, that he yelled ‘fire!’ in the theater is an accurate statement, but we should also add that there was no fire in the theater”) and analysis is performed on facts to corroborate or refute opinions. Bona fide journalism is transparent in its approach of providing facts and presenting the analysis, all done in good faith. So how does this model play out in real-life journalism? One example can be taken from a controversy being covered in the U.S. media in August 2010. The controversy relates to the permission to build an Islamic community center two blocks from the former World Trade Center towers in Manhattan that were destroyed by a terrorist attack in 2001. 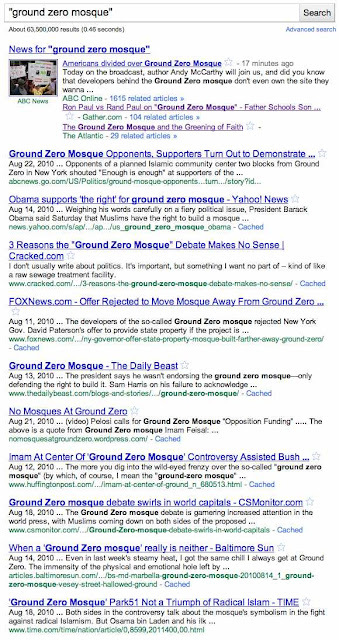 The phrase “ground zero mosque” is being used in the media to refer to the Islamic community center. Agenda-based journalism will use the phrase heavily as it supports the opinion being espoused. Objective journalism will use the phrase frequently as it keeps a neutral position and provides the talking points as espoused by each side, even if the facts are inaccurate, misleading, or absent. Bona fide journalism will document the phrase sparingly and provide the true facts and analysis that support or refute the phrase. 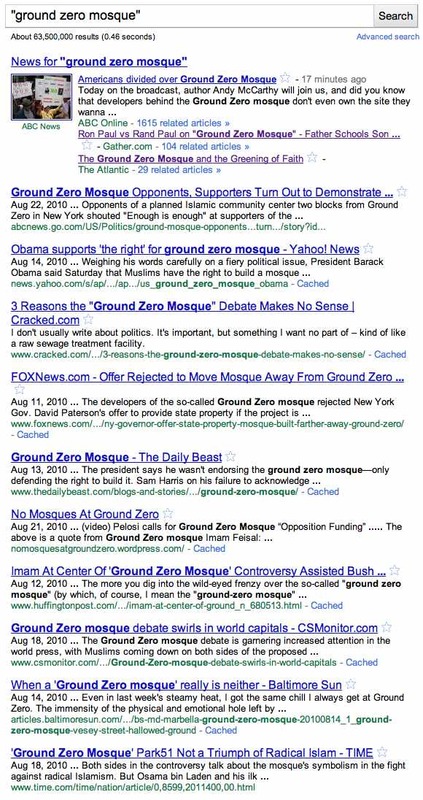 Is it at “ground zero”? No. Is it planned to be a "mosque"? It is a community center with a mosque. As the phrase is not a correct representation of the facts, it is unfortunate that the journalistic genres practiced today promote its use. A search using Google on the phase as of this writing returned over 63 million results. I appreciate several of the guiding principles of objective journalism. Verification of facts, independence from outside groups, and neutrality in the going-in position are all important. Bona fide journalism helps the reader or viewer get closer to the truth and make more informed opinions by providing facts and analysis not encouraged in objective journalism. This includes: vetting of the facts beyond verification; refutation of misleading facts, half-truths, and false statements; collection of additional relevant facts, including context; and analysis of opinions based on the information. Bona fide journalism uses a new writing style. The text is straightforward. Section headings and bulleted lists are encouraged to give structure. Tables and visuals are used to help improve the delivery of the facts and analysis. Conceptually, refer to the posting on Information Mapping to get an idea. Sensational and misleading words are avoided. Headlines should avoid bias. This example shows different headlines for the same news story. Of the three displayed below, The Boston Globe provides the best headline for bona fide journalism. Quotes are never to be taken out of context. Portions of a sentence of a quote are never to be used. This example below quotes a single word ('dictatorial') without context, which would not be allowed in bona fide journalism. Gabe Pressman, an NBC journalist and former chairman of the New York Press Club, has seen many mayors come and go. He has been reporting on the Big Apple since 1954. He finds Bloomberg's management style, particularly his dealings with the press, "dictatorial." Links to full interviews or articles should be provided if quotes are used in the news report. Both the questions and the answers should be provided. A news report should be subdivided into five sections. 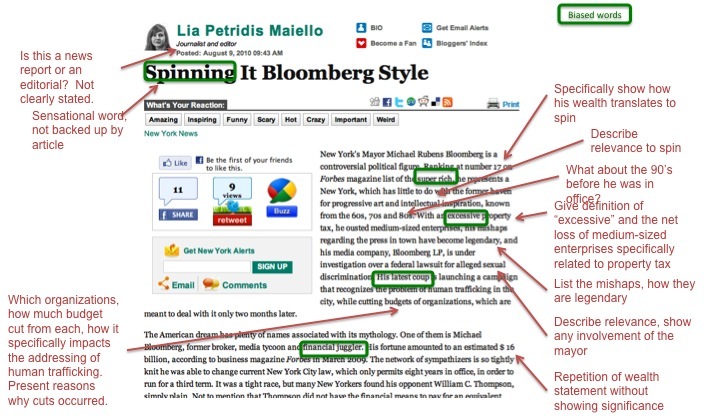 Synopsis One to four bullet points that summarize the key facts and analysis of the news report. Facts The facts, bullet points and visuals encouraged. Facts should have sources referenced in the sources section. The facts should be organized for ease of understanding. Only vetted and relevant facts are listed in the facts section. There is no value in promulgating rumors and false statements. Doing bona fide journalism right is tough. It requires a certain set of skills, values, and knowledge typical of good journalists, including attention to detail, writing skills, fact-checking skills, interviewing skills, analytical skills, and subject-matter expertise. You have to be cognizant of your own biases and viewpoints to make sure it is not getting in the way of the news story. It is not an easy-to-find set of skills and knowledge. Bona fide journalism does not require the skills of marketing, audience-building, tweeting, search-engine analysis, and blogging. While these skills are important for ‘celebrity journalists’ and some other types of journalism, it is not the emphasis of bona fide journalism. This interview with Alan Murray of The Wall Street Journal by the Nieman Journalism Lab provides some additional context of these skill sets. 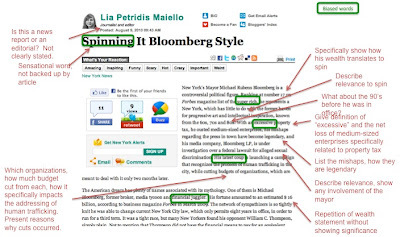 This style of journalism critiques the text, analysis, and opinions written or spoken by others, performing a fact-check to confirm, correct, and question the article. It leverages the objectives and qualities of bona fide journalism, but starts with a news report by another person. The result is a more factual news report and a call out (reprimand) of poor journalism if such is the case. Even an opinion piece that includes or implies facts should be confirmed. I envision a website which contains the full text, marked up in red (with corrections, questions, call outs of faulty reasoning, unsupported assumptions) and blue (confirmation of facts). Here is a conceptual mock-up. I could also foresee this work done by a community of volunteers (paid or unpaid) with the appropriate skill sets of a bona fide journalist. Perhaps two bona fide critics critique an article independently associating the comments with the related text. A summary assessment is provided by each. A third bona fide critic--the lead critic--creates the final critique, leveraging the work by others. All comments by all critics are stored and reviewable by a reader. Picture a more user-friendly version of the Wikipedia history where you can view all edits to an entry. Additional comments may be submitted by readers for a set number of days after publishing. I recommend moderated comments because I believe unmoderated comments add less value and dilute the value of good responses. These comments are reviewed by the three bona fide critics. If one of the critics accepts the comment, it is displayed. A question arises on which texts should be critiqued. Obviously, not all news reports can be reviewed. It should also not be biased against a certain writer, speaker, or news organization. One approach may be a combination of popularity and randomness. Leveraging current tools and technologies to determine the top news reports based on viewership and readership, a randomly selected subset of these should be pulled and placed in the hopper for critique. Weighting should be given to articles of newsworthiness and importance to the public. A database of these critiques can be used to provide a trustworthiness rating of several news organizations, journalists, and news sites. This idea recommends there should one single news article on an evolving story. As an event unfolds and as more facts become known, information should get better. The original article should evolve and correct errors so that the most recent version of the news article is the most accurate and the most complete. The history of the news article should be available so readers can see as time elapsed what new information became available and what information was corrected (e.g., there were 3 people shot, not 5 as originally reported). The time-lapsed news report could be best done on-line, marrying concepts like the Microsoft Word track edit features, the Wiki history, and slidebar to jump to each snapshot of the article. Print versions may be able to convey some of these concepts with bolded text for the latest information, endnotes with time-stamps, and corrections in-line. There should be criteria when a news article is frozen. It could potentially be based on time, the dearth of additional facts, the length of the article, and/or some other characteristic. If another article on the same news story begins, it should reference and link to the first article as background information. These are my three ideas on journalism. I hope to see these ideas improved and made a reality one day. These are some excellent concepts of journalism, well done! Gee, Daniel, I am so darned jealous of that fine mind of yours. Wow! Thank you for sharing so freely here and always giving me good things to ponder!